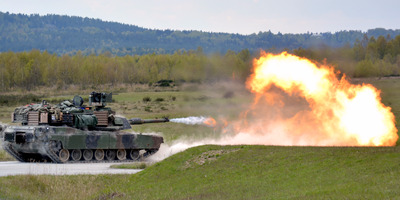 Maj. Randy Ready/US ArmyA M1A2 Abrams Main Battle Tank fires at a target to qualify for Anakonda 16. Foreign militaries have been outfitting their tanks with active-protection systems, which are designed to fend off enemy fire. The US Army has been evaluating APS for some time, and now it hopes to have one on Abrams tanks by 2020. The Army is also reviewing active-protection systems for Bradley fighting vehicles and Stryker combat vehicles. The US Army has been looking beyond armour to augment the defence of Abrams tanks and other armoured vehicles, responding to the emergence of more potent weapons without sacrificing speed and weight. “Today, we need to adapt differently to threats, not just by adding more armour,” Col. Kevin Vanyo, program manager for Emerging Capabilities at the US Army Tank Automotive Research Development, and Engineering Center, told the Army News Service, adding that the Abrams is already so heavy many bridges cannot support it. Vanyo said his team was working on both “hard kill” APS, which uses physical countermeasures, and “soft kill” APS, which uses countermeasures like electro-magnetic signals to interfere with incoming weapons. Both systems would be part of the Modular Active Protection System, which is “a framework for a modular, open-systems architecture” that will allow an active-protection system to function once installed, he said. The Army is considering three versions of MAPS, Vanyo told the Army News Service. 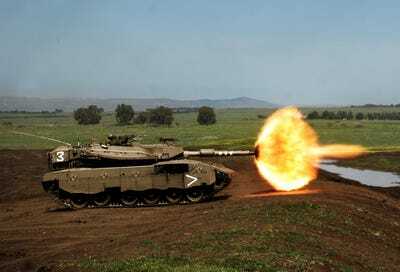 Israeli-made Trophy APS on Abrams tanks, US-made Iron Curtain APS on Stryker combat vehicles, and Iron Fist APS, also made by an Israeli company, on Bradley fighting vehicles. Decisions about fielding the latter two systems will be made in early 2018, but the Army hopes to field the Trophy APS system by 2020, Vanyo said. Congressional Research ServiceHow an APS works. The Trophy system uses fire-control radars and four mounted antennas giving 360-degree coverage to detect incoming projectiles. Once they’re picked up, computers determine firing angles and activate two rotating launchers mounted on the sides of the vehicle that fire a shotgun-like blast. The Trophy system’s estimated cost is $US350,000 to $US500,000 for each tank. Personnel at the Army Test and Evaluation Command’s Alabama test center facility in Redstone Arsenal are working on an APS and other systems that can be deployed as part of MAPS, ATEC chief Maj. Gen. John Charlton told Army News Service. A main concern was figuring out if signals produced by an APS would interfere with the Army vehicle or be detectable by enemy sensors. 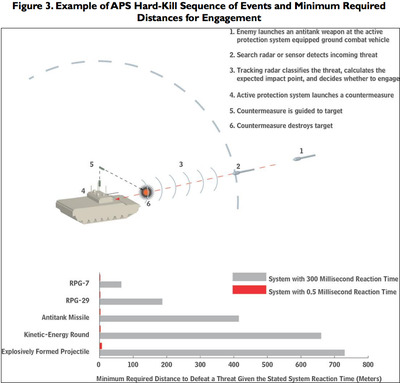 The US Army has been evaluating APS for some time. It leased several Trophy systems in spring 2016, working with the Marine Corps to test them. It has also purchased some systems for testing. “We’re looking to make those decisions rapidly so that we can spend money in the next Fiscal Year,” Bassett said, adding that he foresaw “a brigade’s worth of capability of Trophy on the Abrams.” The 2018 fiscal year began in October. IDFAn Israeli Merkava IIID Baz tank. Active-protection systems are already part of other countries’ arsenals. Israeli and Russian tanks both use the Trophy APS. At least one country, Norway, has publicly discussed ways to counter Russian APS use – talk that appeared to break “a taboo among Western military officials and defence industries,” retired Brig. Ben Barry, senior fellow for land warfare at the International Institute for Strategic Studies, wrote earlier this year. Even as militaries adopt active-protection systems to catch up with peers and rivals, there is reportedly a counter to APS already out there. The most recent variant of the Russian-made RPG rocket launcher, the RPG-30, unveiled in 2008, has a 105 mm tandem high explosive antitank round and features a second, smaller-calibre projectile meant to act as an “agent provocateur” for active-protection systems, a Russian arms maker said in late 2015.